Verstappen was undoubtedly to blame for the incident, and was handed a 10-second time penalty by the stewards in short order. The team tried to alleviate the damage by keeping their remaining driver out on track until lap 42, but a 13.7s pit stop saw the Dutch racer drop from the lead to fifth place, the position he would hold until the chequered flag. The Australian was later quoted by the BBC as having said "It's frustrating. It's not even an overtaking move. It's an emotional response - sees me pass him, wants to make it back and messed it up. … Look, the way Max handles it, more than the way I handle it, will dictate how it goes in the future. For sure I can go and call him names but if he acts like the age he is, or if he acts like a man and admits the mistake." While broken radio equipment is hardly the stuff of intense drama on track, Mercedes’ communications issues on Sunday afternoon had an impact on the eventual race result. 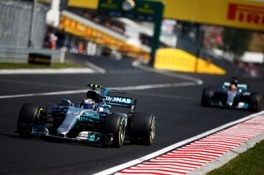 While both drivers suffered radio problems at different points during the Hungarian Grand Prix, Hamilton’s inability to talk to the team saw the Briton pitted earlier than he felt was necessary. With no ability to communicate his desires to the pit wall, Hamilton had to accept the pit stop strategy he was given by the team, despite his belief that his tyres were capable of a longer opening stint that could have seen the triple world champion overhaul Raikkonen on track. The struggling lead Ferrari of Vettel would then have been vulnerable to an attack from his main title rival. "I had really good pace, but I didn't have radio so I couldn't tell them "my tyres are good, let me continue'," Hamilton said after the race. "If I'd stayed out, another five or ten laps, I could have had the chance to attack and overtake the Ferraris maybe. Then I got stuck behind Valtteri, and I lost a lot of time behind him. "I couldn't tell the team I had so much pace, but they could see it, and they didn't act initially. Anyway, he let me by, but I couldn't overtake [Raikkonen] and then I tried to do the right thing at the end." On a day in which both Ferrari and Mercedes saw their faster driver caught up behind the slower car of the pair, there was something of an imbalance in the application of team orders. At Ferrari, eventual race winner Sebastian Vettel was struggling with steering problems for most of the afternoon, with his car pulling left and hampering the German’s ability to race smoothly. Vettel was under instructions to avoid the kerbs, and was unable to pull out much of a lead on his chasing -- and faster -- teammate. Raikkonen called to be allowed to pass, but was told he must achieve the feat on track. 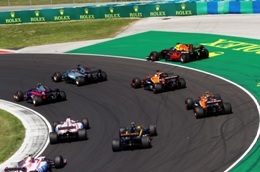 The turbulence caused by the leading car meant that the Finn was unable to get much closer than 1.2-1.5s behind Vettel, and no realistic overtaking opportunity presented itself. In contrast, when Lewis Hamilton was struggling to pass Valtteri Bottas -- despite being significantly quicker on track -- Mercedes ordered their driver pairing to switch places with the proviso that Hamilton had five laps in which to make a move on Raikkonen stick before he had to return the on-track advantage to Bottas. When those five laps passed there was not enough of a gap between Bottas and the chasing Red Bull of Verstappen -- and too much of a gap to the leading Mercedes ahead -- to make a simple switch anything other than risky, and Hamilton maintained track position. 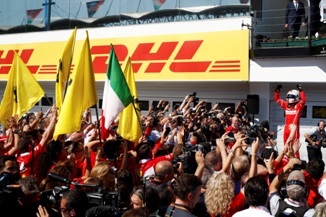 Until the approach to the chequered flag, that is, when Hamilton repaid his debt to Bottas by slowing and allowing the Finn to claim the final podium position, despite the likely impact of those lost points on the drivers’ championship fight.